When I was researching this and other, keyboards, I naturally searched on the keyboard name and 'review' in Google. Almost everything which came up claiming to be a review was actually an online shop regurgitating the manufacturer's sales puff. There was about one real review of this Casio, not very detailed, plus a number of reviews in Amazon, largely of the 'this is jolly good' variety. So I decided that what the world needs is a proper review of this keyboard - albeit rather belatedly as it had been out for a couple of years at the time I originally wrote this (2012). I've illustrated the review with some videos and audio recordings to give an idea of its capabilities. A bit of personal history here: I was taught piano properly from the age of six; when I was in my late teens I was quite a good amateur classical pianist, and also played jazz by ear if not brilliantly at least not painfully. Of course when I left school I fell out of practice, and it wasn't until much later that I bought my own piano - a Yamaha digitally sampled one. More time has passed, and now lack of practice and stiffness with age - 70 when I bought this in 2012 - have made it uncomfortable and rather unrewarding to play the piano, particularly for any length of time: so I decided that a keyboard would at least let me have some pleasure with less strain on the hands, even if it wasn't 'real' piano playing. Why buy the Casio CTK-6000? These days a wide range of keyboards is available at prices which would have seemed impossibly low a few years back. For less than a hundred pounds you can get a 61-key model with full-sized keys (mini-keys are definitely a non-starter) and good facilities: however at that level there is no touch sensitivity and so any piano playing is going to sound like a pianola. Of course I had to choose without being able to try them, though I did look at various YouTube videos; it's quite probable that the Yamaha is slightly the better model, though I wasn't all that keen on either its looks or some of the operational arrangements. However it's somewhat more expensive than the Casio, and, more seriously for me, bulkier and heavier. 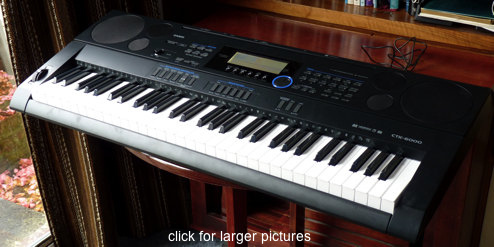 In the end the Casio won out on the best combination of price, size and layout, and facilities (the latter are very similar to the Yamaha though often accessed in a different manner). This review will look at its various facilities, with illustrations (and I ought to emphasize that they are to show off the keyboard, not my playing - please forgive the odd fumbles): here as a taster is a video. Notice that the left hand has very little to do, mostly just specifying the chords for the auto-accompaniment by playing one or two keys. I couldn't have played a boogie left hand like that these days for more than a minute or so before it became painful. The next page will take an overview of the keyboard before proceeding in subsequent pages to a more detailed look.